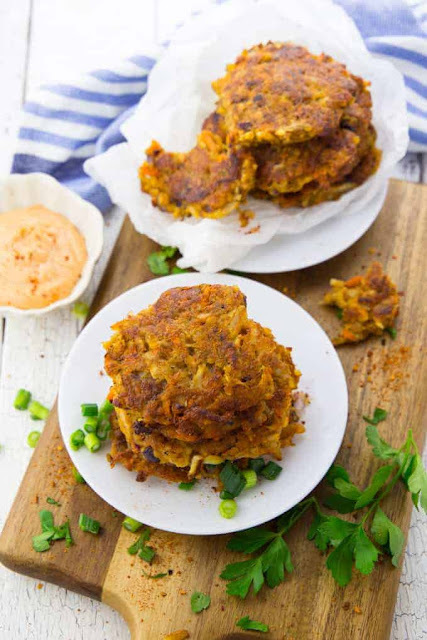 These potato fritters with red lentils are super easy to make and so delicious! They’re best with spicy sriracha mayonnaise. The recipe for these fritters is of course 100 % vegan! 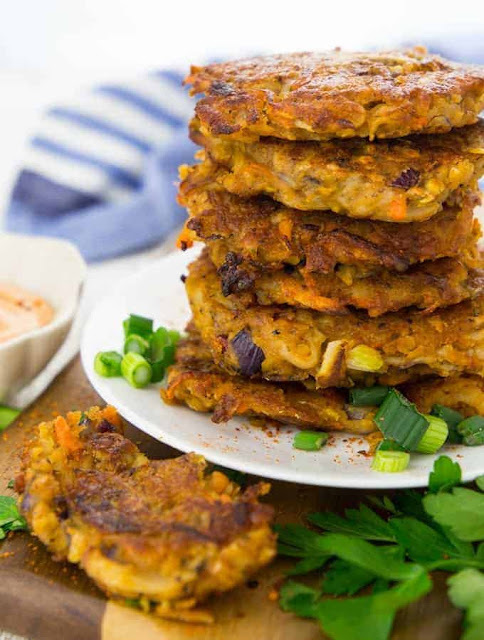 I haven’t made fritters for quite a while, but these vegetable fritters with red lentils turned out so delicious and comforting. 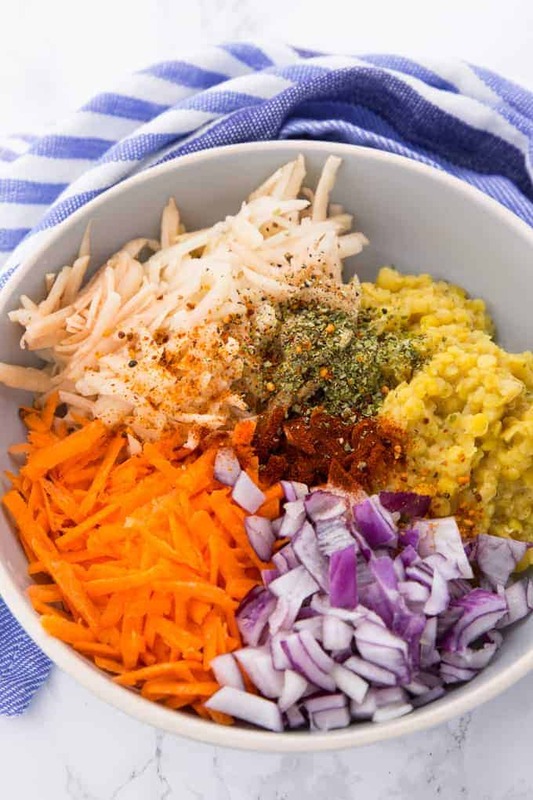 By using red lentils you can add some extra protein to your fritters. If you’re looking for more vegan potato recipes. They’re also delicious with the sriracha mayonnaise ! Many potato fritters contain eggs and are, thus, not vegan. 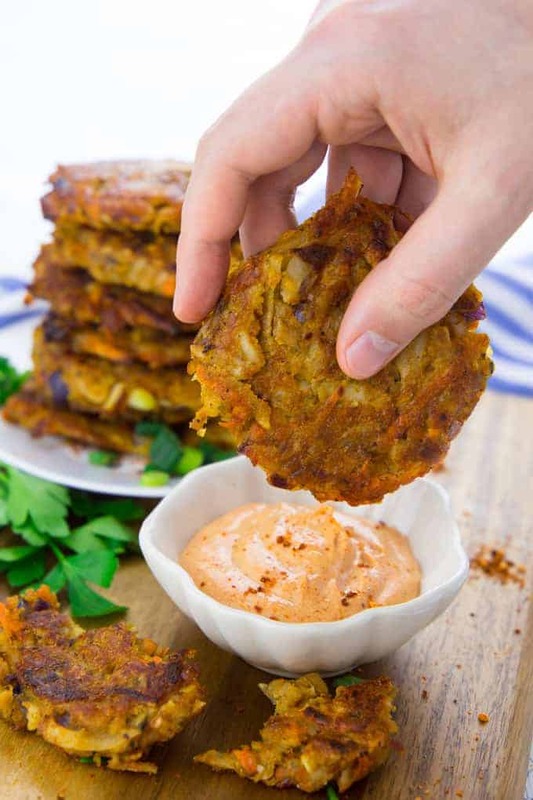 However, it’s super easy to omit the egg and make vegan fritters. They will still hold together very well. Some fritters are “accidently vegan”, meaning that the recipe doesn’t contain any animal products for unknown reasons. Good for us vegans! These potato fritters with red lentils are super easy to make and so delicious! They're best with spicy sriracha mayonnaise. Of course 100 % vegan! Cook the red lentils according to the instructions on the package. Peel and grate the potatoes and the carrot. In a large bowl, combine them with the cooked red lentils, the garlic, the onion, the flour, and the spices and stir well. Heat some oil in a large pan, and add about 1 1/2 heaped tablespoons for each fritter. Cook them on medium heat in a son-sticky pan for three to four minutes on each side. Alternatively, you can also make them in the oven for an oil-free version (about 20 minutes, flipping halfway). For the vegan sriracha mayonnaise, combine all ingredients and stir well. Serve the fritters with a green salad and the sriracha mayonnaise. Enjoy!